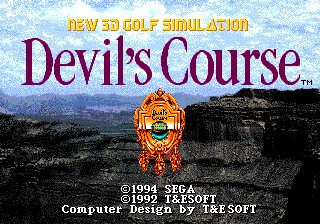 New 3D Golf Simulation: Devil's Course (デビルズコース) is a 1992 golf game for the PC-98 by T&E Soft in their New 3D Golf Simulation series of golf games that takes place on a fictional course. T&E Soft ported it to the Sega Mega Drive in 1994. This version was not released outside Japan (however Bullet Proof Software would release the SNES port overseas as True Golf Classics: Wicked 18), and plays the same as Pebble Beach Golf Links. Main article: New 3D Golf Simulation: Devil's Course/Magazine articles. NEC Retro has more information related to New 3D Golf Simulation: Devil's Course.